Fresh from the oven, right from Irsah inDesigns e-mail inbox, here are some fresh modern sophisticated design baju kurung and dresses from high fashion designer, Syomir Izwa made available at Zalora this June 2014. A brilliant line-up, rich use of colour blocking and inspired by the Art-Deco era, this Hari Raya 2014 will definitely make you look gorgeous yet elegant wearing masterpieces by Syomir Izwa. 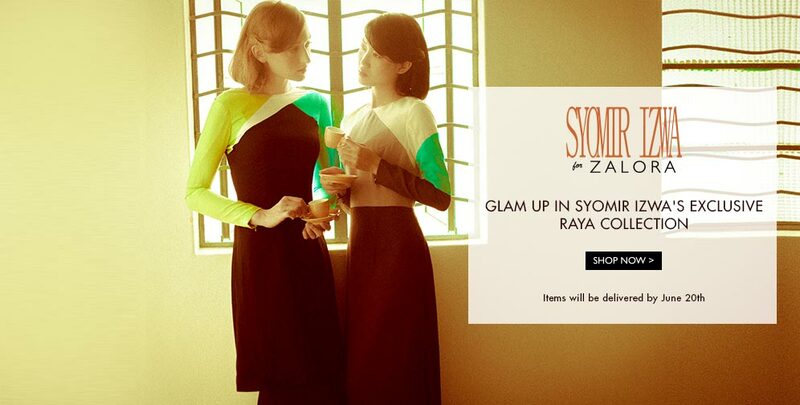 To top of this Hari Raya baju kurung and dresses line-up by Syomir Izwa at Zalora, most of the motives that comes with these dresses can be worn separately! Some of the Art-Deco inspired dresses by Syomir Izwa comes with panelled design and inverted pleats, keeping it simple yet elegant by its own. The materials used for this year Syomir Izwa's collection is made from organic bamboo cotton. A very special material which keeps its shape yet cool and comfortable while wearing it. The baju kurung's and dresses available sizes from XS to XL, custom fit for modern muslimah. Here are 10 out of 19 baju kurung and dresses released for Hari Raya 2014 by Syomir Izwa for Zalora. These baju kurung and dresses designs are amongst Irsah inDesigns designer's favourite picks. The full line-up can be viewed at Zalora's website. Syomir Izwa for Zalora baju kurung and dresses available now at zalora.com.my with price ranges from MYR 460 onwards. Which means FREE delivery nationwide by Zalora! This collection will absolutely inspire your Hari Raya wardrobe collection, keeping you elegant yet sophisticated from the hands of Syomir Izwa.